If you’re an adult with crooked, crowded, or gapped teeth, you’ve likely felt like you are caught between a rock and a hard place. You’d love to straighten your teeth, but you just can’t imagine going to work every day or seeing your friends with metal braces on your teeth. You would just feel too self-conscious. At Hart Orthodontics, Dr. James Hart and our team completely understand these feelings, which is why we’re happy to offer an excellent alternative with ClearCorrect™ Clear Aligners. With this system, you can achieve straighter teeth in less time without having to get noticeable metal braces. ClearCorrect™ is a clear aligner system very similar to Invisalign. Rather than using brackets and wires to straighten the teeth, it instead uses a series of clear plastic aligner trays. These trays simply slip over the teeth, and each one in the series gradually brings the teeth to their ideal alignment. 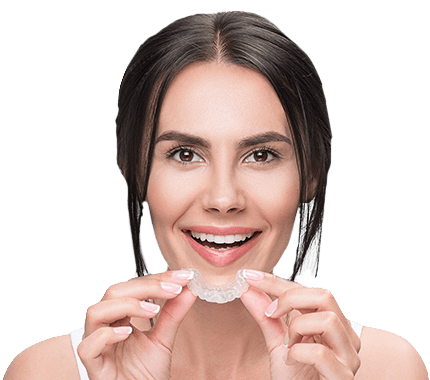 The big difference between it and Invisalign is that ClearCorrect™ is made right here in Texas, which tends to make it a more budget-friendly, but still effective, solution. Subtle Appearance: When worn on the teeth, the trays are practically invisible. In the end, the only people who will know that you are straightening your teeth will be you and Dr. Hart, and he certainly won’t tell! Convenience: The trays simply slide on and off the teeth, enabling you to take them out whenever you eat or brush. With ClearCorrect™, you can enjoy a treatment that transforms your smile and doesn’t affect your daily habits. Comfort: Each ClearCorrect™ treatment is custom-designed to fit a patient’s unique smile out of smooth plastic. Time: ClearCorrect™ doesn’t have to be regularly adjusted like braces, so this means you’ll need to make fewer progress checks with us over the course of your treatment. Come Get Your Straight Smile! If you’re interested in ClearCorrect™, then all you need to do is contact the friendly team here at Hart Orthodontics. We’ll walk you through your treatment options, and if ClearCorrect™ is right for you, we can get right to work creating your new smile. If you have any questions about the treatment or would like to schedule a consultation, contact us today.